All new and returning exhibiting artists are required to submit an application form and pay the exhibit fee on or before the application deadline date. New applicants are selected by jury each season. 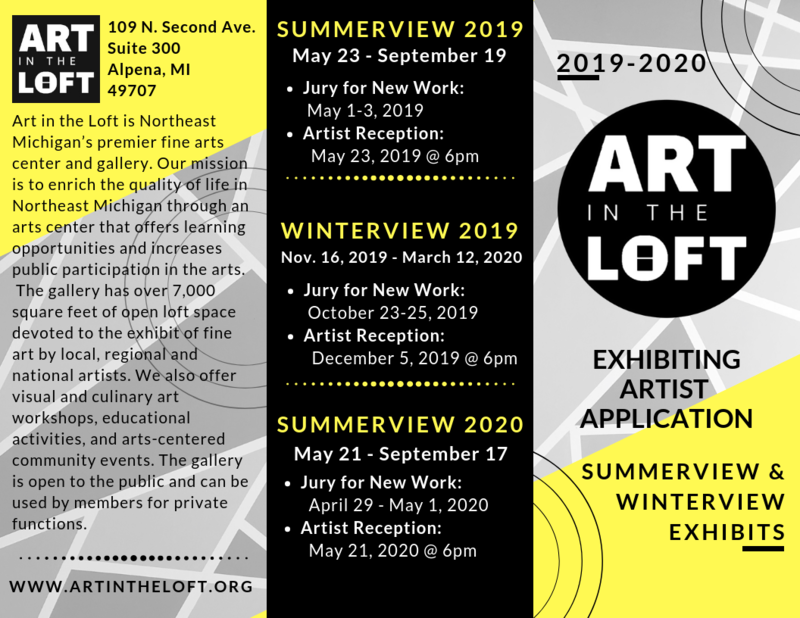 Once an artist is accepted as a member artist, it isn't necessary to be juried again unless more than 3 yrs have elapsed since the artist last exhibited at Art in the Loft or the artist wishes to exhibit in a new media. New applicants (and those who seek to be re-juried) must submit five (5) photos of their work to the jury with their application. The photos should be representative of the work the artist intends to exhibit. Photos should be labeled to indicate the top of the photo and dimension. If an artist is not accepted by the jury for the current exhibit, the membership fee will be fully refunded and the artist may reapply at a later date. Exhibiting artists must arrange to deliver their work to the gallery by the last date for set up. (see application for dates) Artists are encouraged to assist the Presentation Committee in setting up their exhibits. The Presentation Committee reserves the right to arrange the work in the gallery and also the right to reject any work which is nor representative of the juried submissions. All work must be available for sale and each artist must maintain work on display throughout the duration of the exhibit (subject to special arrangements which may be made with the gallery coordinator). Unsold work must be picked up during scheduled times following the close of the exhibit. Exhibiting artists pay a 35% commission on sale of their artwork. Artists who wish to volunteer to staff the gallery are eligible for a reduced commission of 10%. You may also qualify for a reduced commission if you refer a friend. The season that they are juried in as an exhibiting artist, you will get a 15% commission. Arrangements may be made with the Gallery Coordinator to schedule other volunteer duties. Artists are encouraged to promote their work through participation in the gallery events and receptions. The Gallery is pleased to host special receptions, classes and demonstrations to feature the work of artists willing to assist in the planning and presentation. Once you have read and understand the guidelines please print an application form (see link above). Applications are to be mailed to the address below with entry fees enclosed, credit cards are accepted.